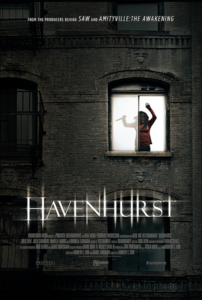 Havenhurst tells the story of Jackie (Julie Benz), a troubled young woman who takes up residence in a Gothic apartment building where her best friend was living when she went missing. 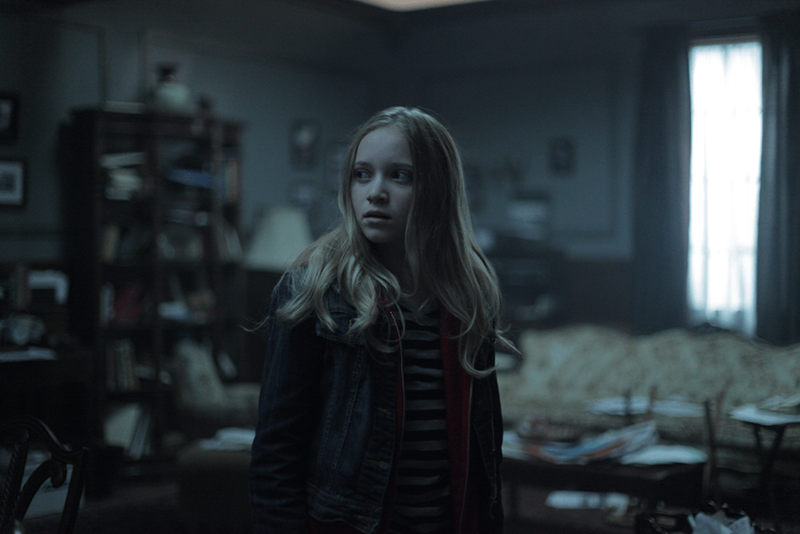 During her stay, Jackie must confront a terrifying evil and try to find the truth about her best friend’s disappearance. The film does a fantastic job of sucking the viewer into the story from the very beginning. The opening sequence features horror favorite Danielle Harris as Jackie’s best friend Danielle, and sets the tone as the bloody mystery of Havenhurst is presented. 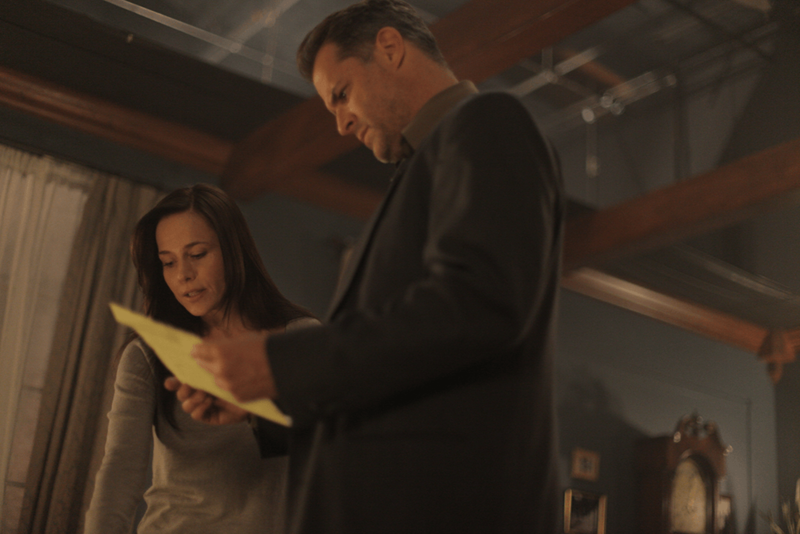 With Danielle missing, a detective named Tim (nicely played by Josh Stamberg) on the case, and Jackie experiencing the mysterious and terrifying happenings at Havenhurst, the movie unfolds as an effective slow burn house of horrors film noir. The filmmakers create a wonderfully dark and heavy atmosphere within ‘Havenhurst’ complete with creaking floors and doors and dark wood paneled walls. The rich color palette of the cinematography gives a muted vibrancy to the fabric of the rugs and furniture through the musty and stale looking air. The film is a beautiful cross between the colorful look of Hammer films of the 1960s and the black and white film noirs of the 1940s. The building that is Havenhurst is a darkly dominant and imposing building shooting high and heavy into the air, topped with sharp and spear-like Gothic style spires. It’s a large, tomb-like building with locked up secrets and a deep, violent history. Havenhurst is full of plenty of horrific surprises, and the building becomes a fun character in and of itself. As for the cast, Belle Shouse is fantastic as Sarah, the young victim of her drunken, abusive foster father living in Havenhurst. Julie Benz is solid, if not a little one note, as Jackie. Her rough history and sad current life is good reason for her character to be a bit numb as a person, and I’m glad the script was strong enough to set that up. It’s hard to show the dynamic Danielle Harris and her strong screen presence for the opening sequence and have to follow that up. As a viewer, I was left wishing Danielle Harris were the lead character. That’s how revered Harris is within the horror genre; using her as a cameo is almost distracting and dangerous, because you end up missing her when she’s no longer on screen. As the mystery of ‘Havenhurst’ unfolds, we get to see some pretty impressive looking gory effects and set ups. I only wish there were more of them. I appreciated the slow burn approach to the film and the patience the script took to lay out the story and flesh out the characters. But the gory horrors looked so good, I would have liked to see a bit more because they felt a little few and far between. With that said, it’s a beautiful looking film with a solid story and strong characters. 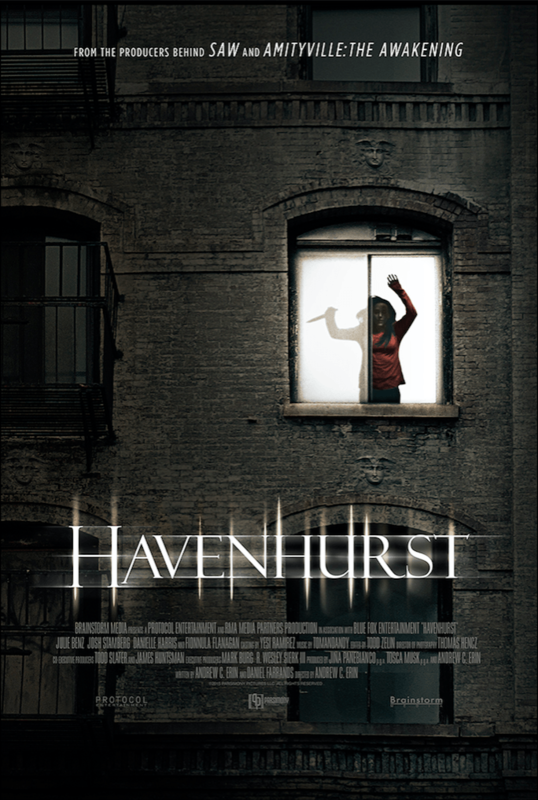 I definitely recommend Havenhurst to any fans of the genres I mentioned…because there’s a lot to like and enjoy. Want a second opinion? Check out our alternate review for this film here.